The boat underwent a large refit in 1999 including the change of the stern to a modern bathing platform, Twin Disc electronic engines controls, and several cosmetic upgrades (salon upholstery, etc...). SSB Skanti - Radar Furuno 72 - GPS Furuno GP 50 - Robertson Autopilot AP 3002 - Twin Disc Microcommander ('99) at two pilot stations + emergency cable controls on fly only. price: $ 1,370,000 (≈ € 1,218,320), VAT excl. 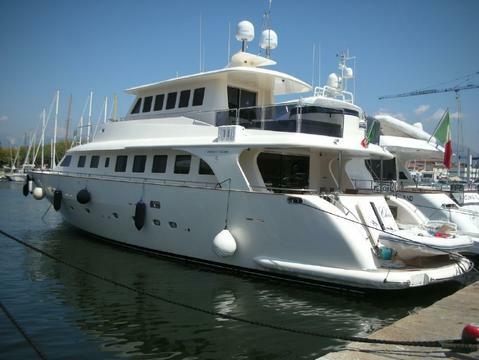 price: € 2,000,000 € 1,490,000, VAT excl.